Also, many people don’t realize this, but, if you had an email account set up with your previous host, when you redirect your nameservers, and have them pointed to Portfoliositez servers, the old email account WILL stop working. Additionally, if you are already hosting with Portfoliositez, and need to change your domain name for any reason, you will want to take this same precaution, as any existing emails associated with the current domain WILL BE irretrievably lost once the domain name is changed. Check! 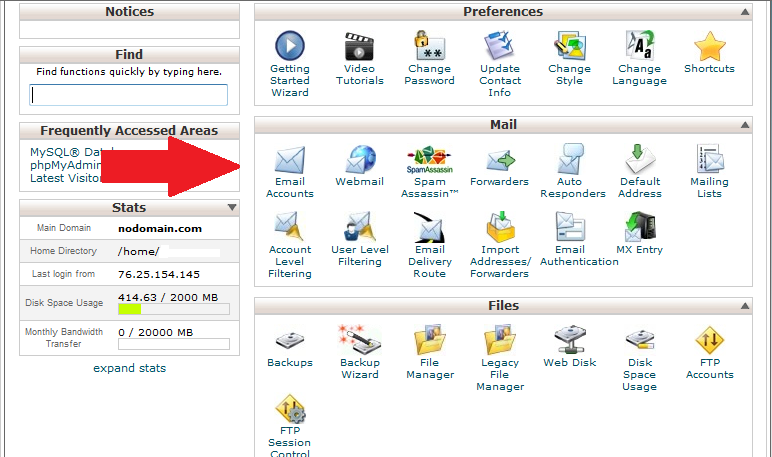 – Has the email address entered in your contact form been CREATED within your control panel? Check! – Are your domain nameservers correctly pointed to your new Portfoliositez server? Check! 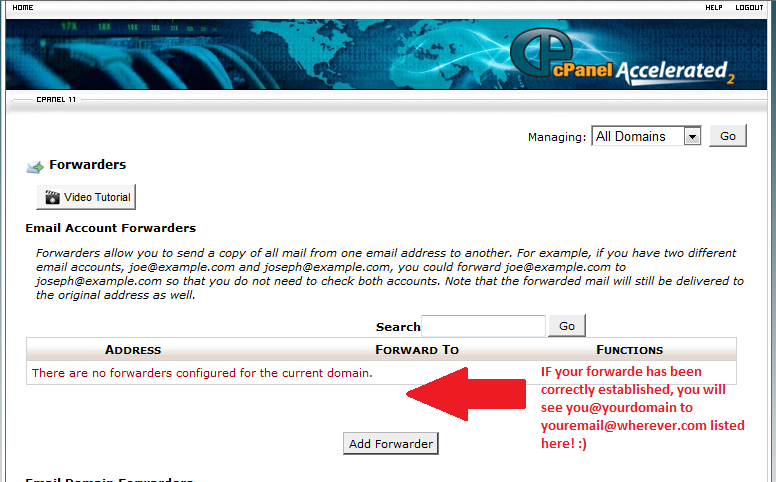 – If you are using a forwarder to copy all messages sent to your domain based email account to a third party email application, is the forwarder correctly established? Issue #3 – I suddenly stopped receiving my emails, or received a quota limit warning!! Check! 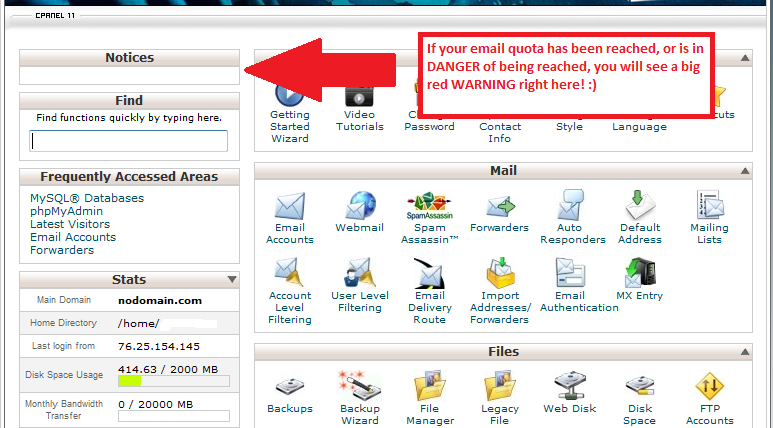 – You email quota is easy to monitor via the home page of your CP. Has your quota been reached? Possible Solution: You can access your Webmail, in this case, via the direct link, if you are able, or via the CP, and delete unneeded old emails. Once this is done, evaluate your QUOTA, and determine whether it should be increased. If you are using a forwarder, it is SO important that you regularly access your webmail and delete old messages to avoid potential issues! NOTE!! Email programs will not function correctly, if your local internet service provider is blocking your correct port # for some reason. If your computers email program does not work , try contacting your ISP and make sure that they are not blocking the port # that you are using in your email configuration settings. If the port number is being blocked , having your ISP unblock the port # for you, will most likely fix your email programs problems. Issue #4 - I can SEND email, but I am not receiving any! The most likely cause for your mailbox not being able to pick up new messages off the server is because your mailbox is full. This can be fixed by setting your mail client to not leave messages on the server and/or deleting the messages in your webmail. You can also set your quota higher. 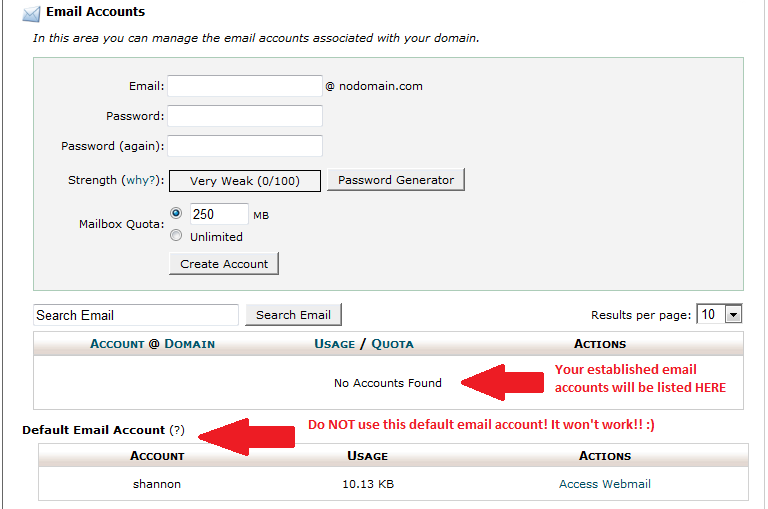 To do this, login to your cpanel, click on email and click change quota on the email address you would like to change. If you have made this fix and the problem persists please contact us immediately! If you're having trouble sending emails on port 25 (the default SMTP port), try switching your SMTP port to port 26. Most ISPs are blocking port 25 to prevent spam accross the Internet, changing your SMTP port to 26 will solve this problem. The other, probably more convenient nowdays way to send mail is authenticated SMTP on port 465. If you are using a desktop program you can also try to set the outgoing mail server to your ISPs server. This would be the same outgoing mail server setting that you use for your ISP email address such as 'kim@msn.com'.